As a Food Bank staff member, I’ve traveled to many churches, schools, community centers, and food pantries across our 34 county service area to meet people living with food insecurity and help tell the story of hunger in our communities. I’ve visited a Kids Cafe in Rockingham, a food pantry in Wilmington, a Kids Summer Meals site in Goldsboro, and everywhere in between. But this week, this particular visit felt close to home: A Raleigh food pantry in my own neighborhood. N.C.A. 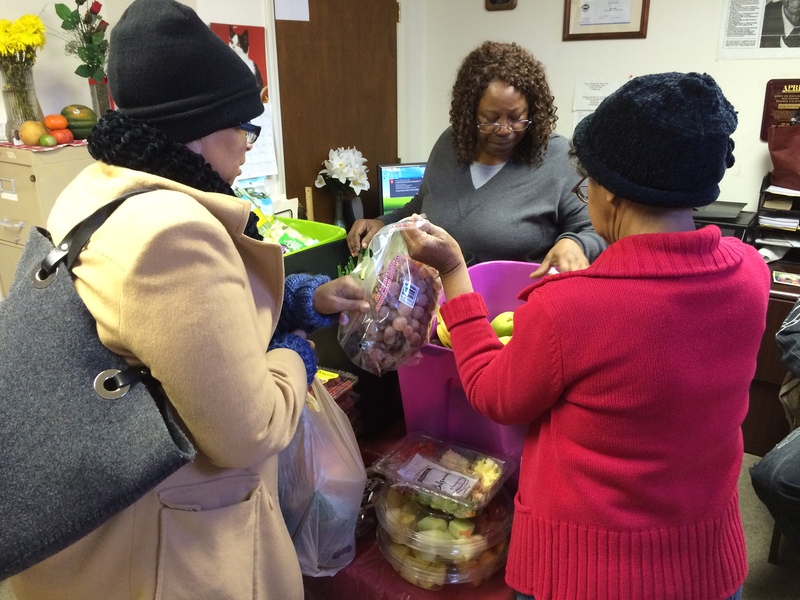 Philip Randolph Institute has partnered with the Food Bank for 11 years and provides emergency food to seniors, families, individuals, and students five days a week. In any given month, they serve about 200 people. I pass this food pantry almost every day. I’ve glanced at the old, brick house with the big porch, but never knew that just on the other side grew a line of people waiting to receive some food to help feed their families or themselves. We often think of hunger as living in that other neighborhood, affecting other people. But for me, it became clear that my own neighbors indeed live with food insecurity and may struggle to afford their next meal. I’ll admit it felt strange and a bit uncomfortable to approach the familiar house. 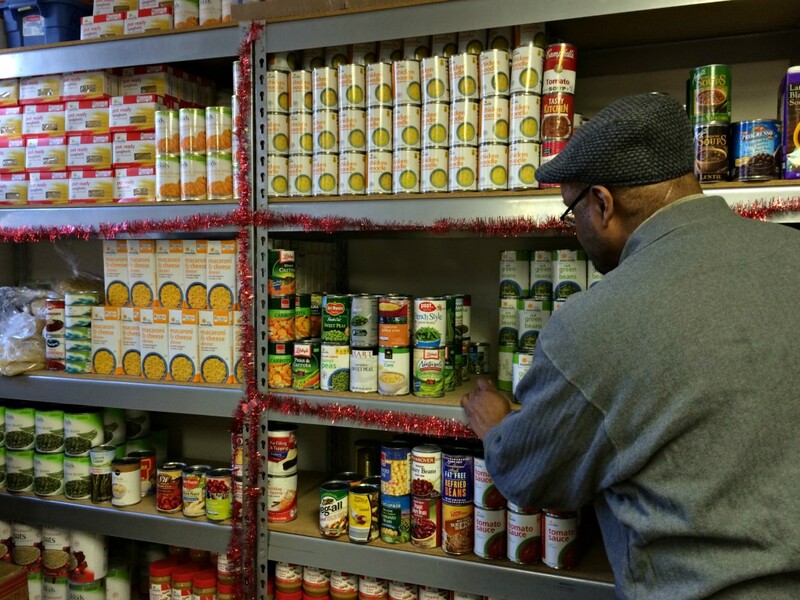 But as I opened the door, I quickly received a warm welcome by the Director of the food pantry, Mary Montford. She led me into a small but very festive room filled with food. I noticed glittery garland on the shelves and fresh produce placed neatly on the table as Christmas music played in the background. Soon after I arrived, a senior walked in. After she filled out some paperwork, she stood in the center of the room and took it all in. She started with the produce. As she picked out some vegetables and leafy greens, she and the pantry volunteers discussed her dietary needs, likes, and even exchanged some recipes. Then she picked out some staples such as canned corn, rice, and oatmeal. The volunteers helped her fill up several bags of food. Volunteers help the senior pick out fruits and vegetables. The woman placed her grocery bags in a suitcase, thanked the volunteers, and left. Mary told me she more than likely lives in a shelter. The volunteers stayed busy, reorganizing the shelves and arranging the produce, making sure everything looked nice and in order. They chatted about the needs of the pantry, the struggles of homelessness, recipes, their kids, and of course, Christmas. A volunteer rearranges the food among the Christmas garland. For a moment, among the holiday cheer, I had forgotten that this room serves a more somber purpose. That is until a mother and her young daughter walked in. The volunteers sprung into action, as they always do, and helped them fill their own bags of food. Mary proudly beamed at her volunteers. “This is a family,” she said. “And this is what we do.” As I watched the girl pick out some fruit, I took some comfort in what she said. Working at the Food Bank, I’m always reminded of the growing need, of the hundreds of thousands of kids who can’t concentrate in school or fall asleep at night because they’re so hungry. At the same time, I also get to see the smile on a child’s face as she places a bag of grapes into her bag. It’s a comfort to know, especially during the holidays, that we helped make a difference in that kid’s life. Yes, hunger may always be close to home. But good hearts and generous spirits will be there, too. 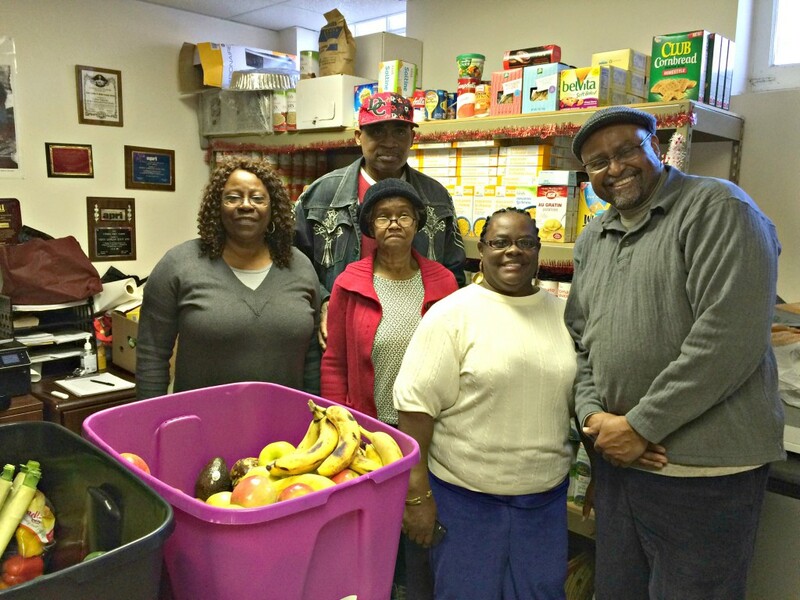 Mary Montford (second from right) stands with her volunteers in the food pantry.